Kanye West and North West were of course at the 2018 Kardashian Christmas Eve Party, and North was quite the showstopper. Kim Kardashian shared a "controversial" photo of 5-year-old daughter North West in a bikini. Some fans decided that this was scandalous and responded with mom-shaming. 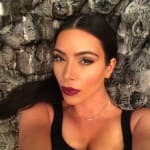 Kim Kardashian revealed that it took multiple lollipop bribes to entice all of her children to pose together for this precious Mother's Day photo. Lollipops well spent. Check out this family photo! You don't see Kim Kardashian and Kanye West with all their kids too often. Dream Kardashian and North West have been hanging out. And fortunately for us, Rob Kardashian documented the cuteness.